A tachymeter (pronounced /tæˈkɪmətər/) scale is a scale sometimes inscribed around the rim of an analog watch with a chronograph. It can be used to compute a speed based on travel time or measure distance based on speed. The spacings between the marks on the tachymeter dial are therefore proportional to ​1⁄t, where t is the elapsed time. The function performed by a tachymeter is independent of the unit of distance (e.g. statute miles, nautical miles, kilometres, metres etc.) as long as the same unit of length is used for all calculations. It can also be used to measure an industrial production process in units per hour. A tachymeter is simply a means of converting elapsed time (in seconds per unit) to speed (in units per hour). where T is the tachymeter scale value; t is the time in seconds that it takes for the event to occur; and 3600 is the number of seconds in an hour. As a sample calculation, if it takes 35 seconds to travel one mile, then the average speed is 103 miles/hour. On the watch, 35 seconds gives scale value 103. Similarly, if one kilometre takes 35 seconds then the average speed would be 103 km/hour. Note that the tachymeter scale only calculates the average speed. As a second example, if it takes 20 seconds to travel one unit of distance, then the average speed on the watch used for the purpose of the picture only is 180 units of distance per hour (examine the picture of the watch which is here to simplify the idea, actual tachymeters may vary slightly). For events that happen either very quickly or slowly, one can adjust the sixty-second tachymeter scale commonly found on watches. Smaller fractional units can be used for slower objects, like runners, turtles and snails, but the same X/hour function remains constant. The scale on a watch is only valid for things that happen in 60 seconds or fewer, and the scale is also difficult to resolve for events that take fewer than 10 seconds or so to occur. As an example, if it takes 100 seconds to eat an apple, cutting that number in half allows one to say that it takes 50 seconds to eat half an apple. Using the tachymeter scale one can calculate that 72 half apples (36 whole apples) could be eaten in one hour. Some watches, not common, have 'wraparound' or 'scroll' scales, which extend the readings to lower speeds, typically 45 units. A counter-intuitive method of measuring speeds slower than can be directly indicated was published by Michael Bilow on the web site TimeZone.com: "Because the tachymeter scale is calibrated quite simply as divisors of 3600, it is easy to use the 0-60 segment as a reference scale for the reciprocals. That is, since something which traverses the unit distance in 45 seconds is going 80 units per hour, then it follows mathematically that something which traverses the unit distance in 80 seconds is going 45 units per hour. Since something which traverses the unit distance in 30 seconds is going 120 units per hour, then it follows that something which traverses the unit distance in 120 seconds is going 30 units per hour.... Using this method, it is fairly simple to read by inspection nearly any slowly moving object down to the range of 8-12 units per hour." The method was later explained in detail: "It is not intuitive to use the tachymeter scale in this way because there will, in all likelihood, not be any hands pointing to the important places on it. 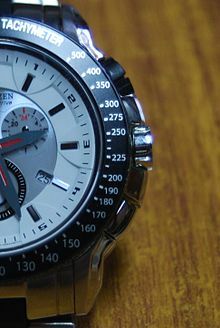 Unlike the conventional use of the tachymeter scale to measure things which take 60 seconds or less to traverse the unit distance, you must mentally move from the number of seconds measured on the chronograph to the same number on the tachymeter scale, and only then read the number opposite on the dial. The ability of the tachymeter scale to be used 'backwards' like this, freely interchanging time and rate, is a direct consequence of the fact that it is created as a table of reciprocals in the first place." A tachymeter-equipped watch can be used to measure distance by timing the travel over the distance while the speed is held constant. The tachymeter scale is rotated to align with the second hand at the start of the length to be measured. When the second hand reaches the point on the scale where the speed indicated equals the speed of the vehicle, one unit of distance (miles if speed is miles per hour, kilometres if kilometres per hour, etc.) has been covered. For example, if you travel at a constant 80 mph (or at 80 km/h), then the distance travelled while the second hand sweeps to "80" (45 seconds) will be exactly 1 mile (or 1 kilometre at 80 km/h). Some tachymeter scales are on a rotating, indexed bezel. This allows two additional modes of use: The tachymeter bezel can be aligned with a free running second hand, and, more subtly, can be used to find the average speed over longer times/distances. Set the rotary bezel index to the position of the minute hand, note the current mileage/distance. Glance at the position of the minute hand on the tachymeter scale 60 units of distance later, and average speed will be indicated. A little mental math allows interim averages, easiest at 1/4 (15 unit) and other integer values. Alternatively, instead of using minute hand, align index bezel to the second hand and observe passing one unit of distance when position of the second hand will then indicate average speed. ^ Bilow, Michael (2000-09-06). "1433 : Method of measuring slow speeds with a tachymeter scale". TimeZone.com. Retrieved 2018-03-21. ^ Bilow, Michael (2000-09-07). "1434 : Measuring slow speeds with a tachymeter: step-by-step". TimeZone.com. Retrieved 2018-03-21.